WASHINGTON (CNS) — Pope Francis’ apostolic exhortation on marriage and family life, “Amoris Laetitia,” calls on priests to accompany couples and individuals facing the challenges of modern life, so they can draw closer to Christ and experience his love and mercy, Washington Cardinal Donald W. Wuerl said Jan. 21. 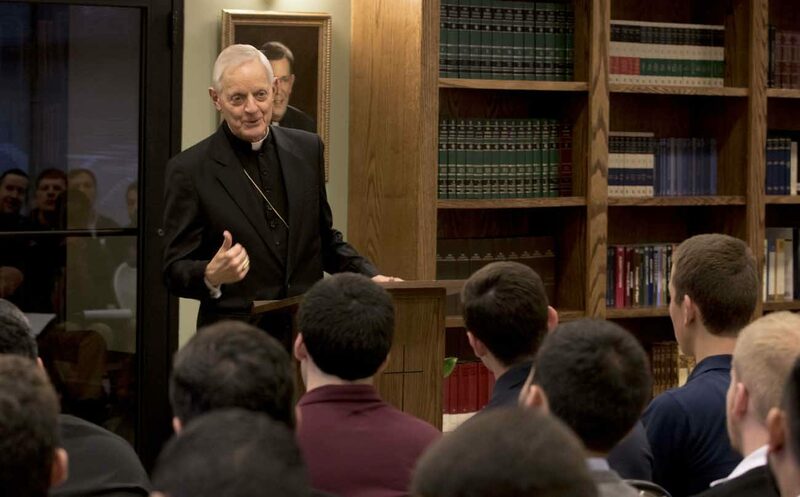 He addressed a workshop on the papal document for seminarians of the Archdiocese of Washington. About 60 stateside seminarians of the Archdiocese of Washington attended the workshop at the St. John Paul II Seminary. They were joined via a Facetime hookup by another 10 of the archdiocese’s seminarians who are studying at the Pontifical North American College in Rome. The Washington seminary’s priest faculty members also attended the gathering. The workshop also included a talk on priestly formation by Msgr. Robert Panke, rector of the seminary and director of the archdiocese’s Office of Priest Formation. Local pastors spoke on how the papal exhortation is assisting them in their work of preparing and working with married couples. A recent publication from the archdiocese’s Office of Priest Vocations and Formation, “Reflections on ‘Amoris Laetitia,'” formed the framework for the discussion. “When we begin our reflections on the pastoral implications of ‘Amoris Laetitia,’ we need to start with the understanding that none of the teaching of the church has been changed: This includes the teaching on the indissolubility of marriage, the directives you find in the Code of Canon Law, and also the role of individual conscience in the determination of personal culpability,” the cardinal said. Cardinal Wuerl said that this past year, Pope Francis issued “Amoris Laetitia” (“The Joy of Love”) knowing that many people in today’s world live in a highly secular culture where their values are shaped by materialism, individualism and relativism. “The pope noted that it is precisely in this context that our people live and that our teaching must help them move beyond,” the cardinal said. Pope Francis encourages pastoral accompaniment of couples, “even for those in a marriage that does not reflect entirely the church’s teaching. … Christ inspires the church to turn to them with love and affection to assist them in overcoming the trials they face,” the cardinal said. Cardinal Wuerl underscored the importance of the sacrament of confession and pointed out that Pope Francis in announcing the Year of Mercy described God’s mercy as “the beating heart of the Gospel.” The cardinal said “Amoris Laetitia” emphasized that sharing God’s love and mercy should be at the heart of the Catholic Church’s outreach to married couples and families. “The Holy Father points the way to how the church might take steps to support married couples and families in their lives today, and to mercifully bring hope and healing to those who find themselves in broken and wounded situations, with a sensitivity toward the diversity of particular relationships and cultures,” the cardinal said. The pope in “Amoris Laetitia” also said supporting marriage and families should be undertaken in a more extensive way so the church’s pastoral outreach can help people at all stages of married and family life encounter Christ. “The Holy Father calls for a family apostolate that offers more adequate catechesis and formation, not only of engaged and married couples and their children, but also priests, deacons, seminarians, consecrated religious, catechists, teachers, social workers, medical professionals and other pastoral workers,” the cardinal said. The exhortation was shaped by the findings of two synods called by Pope Francis, the cardinal noted, one in 2014 on the challenges of marriage and family life today and another the next year on responding to those challenges through church teaching. Cardinal Wuerl said “Amoris Laetitia” is “a consensus document” reflecting synod statements that all received significant approval from participating bishops from around the world. “Amoris Laetitia” also is a “continuity exhortation,” the cardinal said, noting it offers papal magisterium in continuity with the teaching of recent popes and church tradition, with numerous citations from St. John Paul, Pope Benedict XVI and Blessed Paul VI, and from the Second Vatican Council, the Catechism of the Catholic Church and St. Thomas Aquinas. Concluding his remarks, the cardinal noted that pastoral accompaniment involves the priest walking together with the individual or couple on a journey to Christ. “In the action of going out, encountering, sharing and accompanying, we also recognize that in the journey, we — ourselves — are also drawing closer to the Lord,” he said. In his opening talk, Msgr. Panke said the four elements of priestly formation — human, spiritual, intellectual and pastoral — help priests and those preparing for priesthood configure their minds and hearts to Christ, so they can “teach the truth with love and patience” and accompany those whom they serve and lead them to Jesus. In the pastors’ panel on “Amoris Laetitia,” Msgr. Eddie Tolentino of St. Michael the Archangel Parish in Silver Spring, Maryland, said he plans on using the exhortation to redesign his parish’s marriage preparation program and its outreach to married couples. Its title, he said, reflects two key aspects of God — joy and love — that should shape a parish’s marriage ministry. ADMITTING THE TREMENDOUS CHALLENGE TO CO-HABIT WITHOUT ADULTERY OR FORNICATION, THE ENCYCLICAL OBVIOUSLY -IN INTERPRETATION AT LEAST – ADMITS THAT THAT THESE SINS WILL BE INEVITABLE! I HAVE HEARD NOTHING ABOUT AVOIDING THE NEAR OCCASIONS OF SIN, HAVE I?